I have been revisiting my database of seventeenth-century medicinal recipes to look at plant ingredients and their sources. It is striking how spices and other imported items were frequent ingredients in medicinal recipes, both in household collections and printed texts. For example, cinnamon occurs 226 times in 3604 printed recipes, about 6.3% of all recipes. Sugar appears over twice as often. I wanted to investigate the extent to which household remedies might include plants recognised and obtained from the wild. This raised questions for me to do with the intertwining of different traditions of classical sources and folklore in plant knowledge. A starting point would be to look at the frequency of some key folklore plants appearing as recipe ingredients. A major element of folklore tradition is its orality, but this is notably hard to document and identify key plants. I used Allen and Hatfield’s Medicinal Plants in Folk Tradition, an excellent text that evaluates the sources available on the folklore of plants, avoiding the historical focus on herbals and received wisdom passed down from classical Mediterranean sources–what we tend to define as the ‘learned’ tradition. Based on Allen and Hatfield, I identified a selection of some forty medicinal plants, all known for having widespread past use in the British Isles independently of the classical sources. To avoid my own confusion with words such as ‘tradition’ and ‘folklore’ I have called these plants ‘folkloric’. I looked at the number of occurrences of each of the folkloric plants in manuscript and printed medicinal recipes. The average (mean) frequency of a folkloric plant was about seventy-five mentions in either manuscript or printed recipes, which was more frequent than plants in general (appearing an average of forty-seven times each). However, the figures vary considerably for certain individual plants. 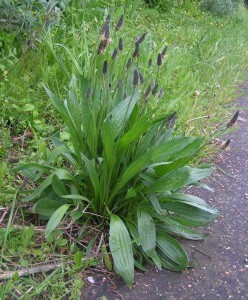 Plantain (Plantago spp.) occurred very frequently. It appeared 224 times in the printed recipes, but was included in manuscript recipes slightly less often. This is comparable to the frequency for cinnamon. But if only recipes from named people are considered, the proportion of those including cinnamon increases and the proportion including plantain decreases. 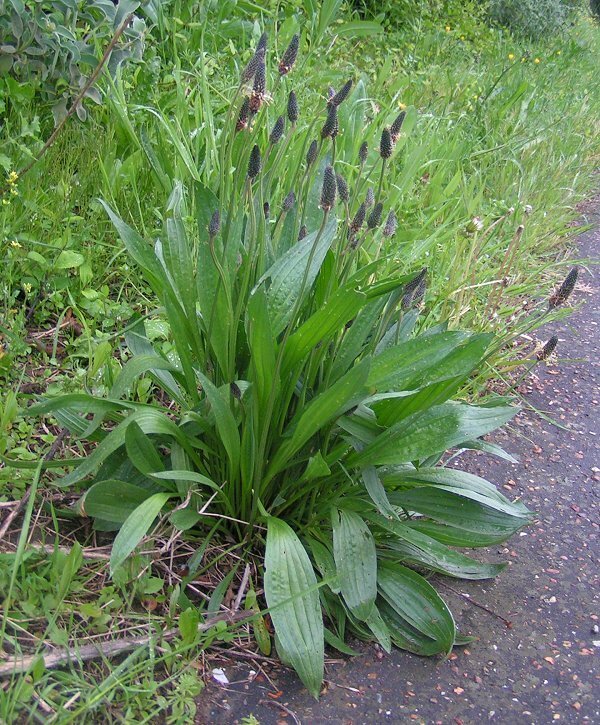 Both ribwort (Plantago lanceolata, Figure 1) and greater plantain (P. major) are widespread. In folklore tradition, according to Allen and Hatfield, plantain is considered a great ‘wound healer’ due to its ability to stop bleeding and used for wounds, rashes, stings and other skin complaints. In the learned tradition, according to Gerard’s herbal, plantain was reckoned moderately cooling and drying. Quincy later described plantain as ‘a great Cooler, and stopper of Fluxes, particularly of Blood, whether from the Nose, Mouth or Uterus’. Plantain was much favoured as a distilled water and twenty-four of the manuscript recipes and thirty-two of the printed recipes were for plantain water. 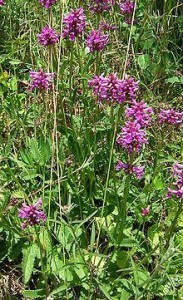 The next most frequent plant from the folkloric list was Betony (Stachys officinalis, Figure 2), appearing 282 times in all, about equally in print and manuscript. Though something of a cure-all, the records of folk use for betony, according to Allen and Hatfield, may partly arise from confusion with a other herbs including speedwell (Veronica spp., Figure 3, seems hard to confuse though?). Gerard’s herbal lists Betony as hot and dry. 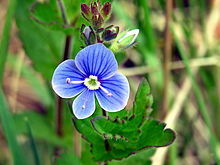 This plant was also favoured as a distilled water with other herbs in a number of plague and cure-all waters. Quincy, too, notes possible confusions of Betony with other plants, and that it is ‘accounted a great Dryer’ especially for ‘rheums’ and wounds affecting the head, thus also having a humoral action of clearing phlegm. The main folkloric use of these plants was for their drying effects to dispel unwanted fluids from bleeding wounds to phlegm. In addition these herbs were either cooling and soothing for irritated conditions from skin problems to irritating coughs (plantain), or heating and stimulating for the stomach and head (betony). 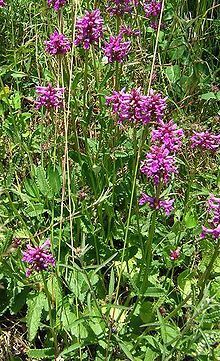 Finding the high frequency of occurrence of plantain and betony might be consistent with use in both folklore and classical traditions. Whether these uses are distinguishable needs further work! In my next post, I will look at other folkloric plants that featured more or less frequently in the recipe database. Bonnie B. O’Connor and David J. Hufford, “Understanding Folk Medicine”. In Healing Logics: Culture and Medicine in Modern Belief Systems, edited by Erica Brady, (Logan: Utah State University Press, 2001), pp.13-35. David E. Allen and Gabrielle Hatfield, Medicinal Plants in Folk Tradition: An Ethnobotany of Britain & Ireland (Portland, Oregon: Timber Press, 2004). Allen and Hatfield, p.247; John Gerard, The Herball or Generall Historie of Plantes (London: Printed by Adam Islip Ioice Norton and Richard Whitakers, 1633), p.107; John Quincy, Pharmacopoeia Officinalis & Extemporanea, 8th ed. (London: J. Osborn and T. Longman, 1730), p.98. Allen and Hatfield, pp.212-3; Gerard, p.160; Quincy, pp.72-3.